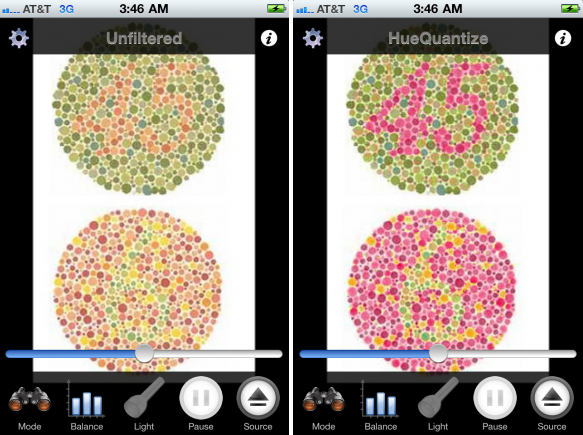 Dan Kaminsky released an Dankam, an augmented reality app for color blindness available on iPhone and Android. DanKam is an augmented reality application for the color blind. It assists its users in determining colors, or differences in colors, that would otherwise be invisible to them. DanKam is based on a theory of the human visual system which states that somewhere in the human visual system, processing is done on the pure color — the hue — of something seen. The thinking is that there are relatively few hues the visual system actually sees, but for the color blind, hue determination (specifically between red and green) is impeded by slight changes in the eye. So DanKam, through its various modes, attempts to make hues easier to detect and differentiate.